I reviewed one of the BluRays in this series in the last issue of Music Street Journal. The idea here is that Eagle Rock are utilizing the extra space BluRay allows to reissue two DVD releases on one disc. 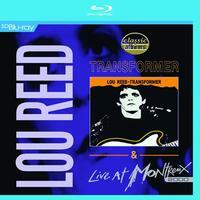 This time around it’s Classic Albums: Transformer and Live At Montreux 2000 from the late great Lou Reed that gets this treatment. The documentary is one of the best of the Classic Albums series. It really gives a lot of insight into the history leading up to Reed’s best known album along with a lot of insight into the creation process of the disc and the mechanics and more. Even by itself, it’s highly recommended. The live performance captured in the other feature here is top-notch. The Reed and his band played an awesome show. The mix of tracks was impressive and the sound and video were both great. I reviewed that one before in DVD format and here's what I said about it: "Fans of Lou Reed should eat this up. It's a live performance captured on DVD, and the videography and performance are both quite solid. Reed's trademark singer/songwriter sound is captured here in a series of 16 tracks. I'd have to say that more casual fans would probably not be overly pleased as his most famous cut 'Walk on the Wild Side' is not here. That said, if you give this one a chance, Reed's talent will win you over. For those willing to look a little deeper into his catalog there are classics to be found in such sounds as 'Romeo Had Juliette,' 'Dirty Day' and 'Perfect Day.' "So, again, when you put these two things together, this is well worth having.